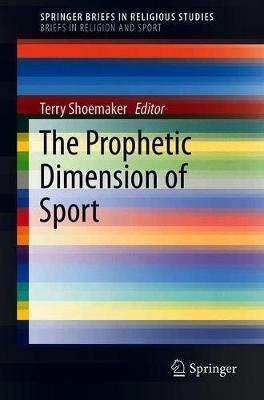 Bringing together leading scholars in the fields of Religion and Sport, this book examines the prophetic dimension of sport, to arrive at a better understanding of the nature of sports in the United States. By detailing and analyzing particular sports, a portrait of sport as an important space for social and political critique emerges. Sport is indisputably an important cultural phenomenon in the United States. Each year millions attend sporting events, track the statistics and lives of sports stars, collect memorabilia, engage in fantasy sports, and play various sporting games. But increasingly, sport is also a space for public articulations regarding social and political issues within the United States. What are we to make of these particular articulations? What do they tell us about the nature of sport in the United States? How are these social and political critiques formed? Why do sporting voices seem to carry more weight at this moment in history? Ideally suited for use in undergraduate and graduate courses, this book offers a new way of thinking about the connection between sport and religion in a secularizing society. By analyzing various sports and particular historical moments, the chapters supply a unique example of the relevance of sport as it pertains to social and political critique. Illustrations note 1 Illustrations, black and white; VII, 57 p. 1 illus. Chapter 1. Introduction, Terry Shoemaker, Arizona State University.- Chapter 2. The Prophetic Dimension of Sport, Eric Bain-Selbo, Indiana University Kokomo.- Chapter 3. Who is Prophet? Jackie Robinson, Branch Rickey, and the Integration of Baseball, Rebecca Alpert, Temple University.- Chapter 4. Basketball, Black Lives Matter and Prophetic Imagination, Terry Shoemaker, Arizona State University.- Chapter 5. Disrupting the NFL's Civil Religious Canopy: Super Bowl Half Time Show as Prophetic Stage, Jeffrey Scholes, University of Colorado.-Chapter 6. The Problem with Winning: How Evangelicals Have Tried (And Failed) to Change the World of Sports, Annie Blazer, William & Mary.- Chapter 7. Response: TBD. Terry Shoemaker holds a Lecturer position in the School of Historical, Philosophical, and Religious Studies at Arizona State University. His research focuses on sites of resistance within religious communities and social pressures inherent in religious shifts.